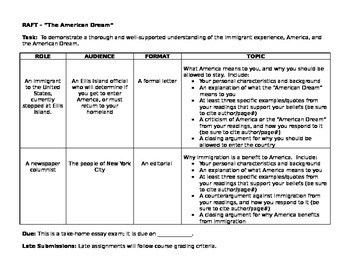 Task descriptor (from assignment): "To demonstrate a thorough and well-supported understanding of the immigrant experience, America, and the American Dream"
This is a RAFT (Role, Audience, Format, Topic) essay used at the end of a unit on immigration and/or the American Dream. I have typically used it in junior- and senior-level literature courses, but it would most likely work for any high school literature or history unit focused on immigration issues. 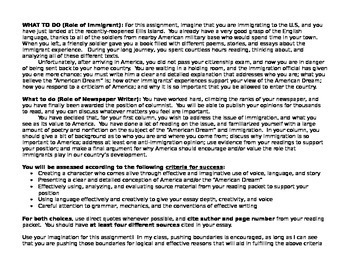 Students write from one of two perspectives (new immigrant or newspaper columnist) and address specific points regarding their beliefs in the American dream and/or immigrants. 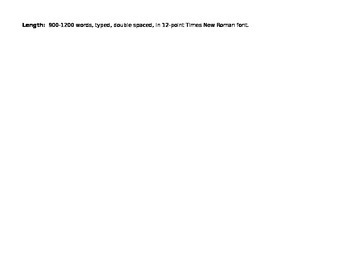 Assignment includes role, audience, format, and topic guidelines, criteria for success, descriptions of scenarios, and rubric for grading.